Recently restored in memory of Sarah E. O'Donnell, this late nineteenth-century American oil painting probably shows the interior of "Fredonia," a twenty-room mansion built by John Murray Forbes on Milton Hill about 1860. Forbes made his fortune with his brother, Captain Robert Bennet Forbes, in the American-China trade and like other traders decorated his home with luxury goods from China. The house stood near the current center of the Forbes Road subdivision until it burned, unoccupied, in 1949. The inclusion of the early telephone in the painting may not be coincidental. William Hathaway Forbes, son of John Murray Forbes and his wife Sarah Hathaway, was the first president of the American Bell Telephone Company. Alexander Graham Bell, after being rejected by Western Union, turned to New England investors, among them William Hathaway Forbes. William's father was not sanguine about the risk, which is itself ironic, since John Murray had invested his China trade earnings in railroad, a far riskier industry than telecommunications turned out to be. Both father and son were successful, however. As president of the Michigan Central Railroad, John Murray Forbes beat Cornelius Vanderbilt in a classic railroad-building race, becoming the first to connect Chicago to the East Coast. You can learn far more about this extraordinary man and the Forbes family at the Forbes House Museum on Milton Hill. 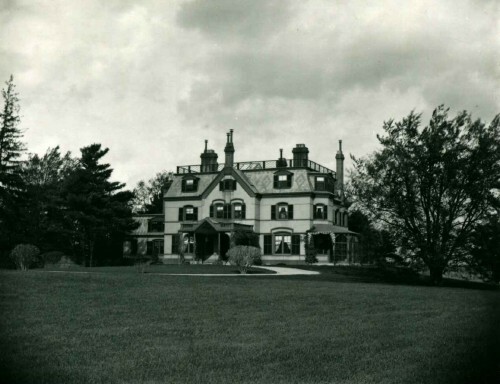 Below is a photograph of Fredonia by pioneering Milton photographer Margaret Sutermeister.